Bar tables transform a space into an intimate place where a small group can gather over drinks or food. Just the presence of a pub table creates a cozy, warming atmosphere. Now, if you’ve ever taken refuge on a cold evening in the warmth of a log cabin or ski lodge, you know the beaming coziness that is hallmark of a lodge setting. Perhaps it’s the connection to natural wood that gives warmth that is unparalleled by other buildings. The Cedar Round Pub Table harnesses the power of the pub table and the power of the wood cabin setting to deliver a down to earth, rustic, traditional, welcoming vibe. 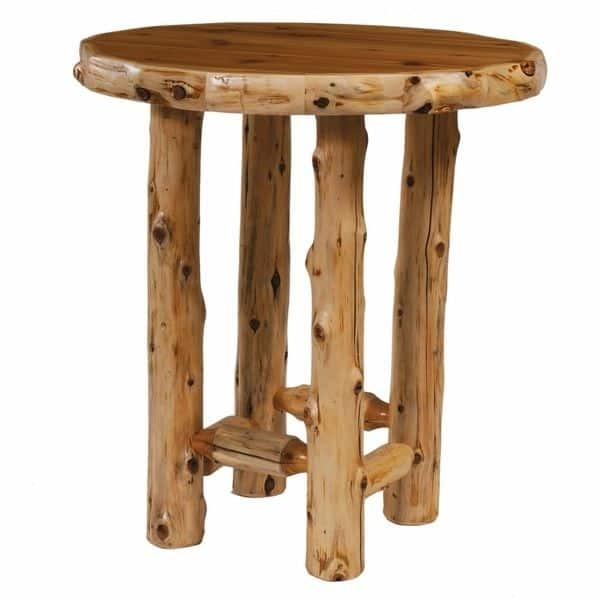 Real Northern White Cedar logs are used to make the Round Pub Table. Northern White Cedar logs are peeled and assembled by hand to maintain their natural luster and display their organic brilliance. Please Note - All Fireside products are made to order and have a general production lead time of 5-6 weeks. Transit time for delivery is approximately 5-7 days. Shipping Details & Conditions.